Xiaomi is getting into the smartphone SoC business with the Surge S1, their first ever chipset. The company has been working on the Surge S1 for the past 28 months, and it's now ready to debut in the Xiaomi Mi 5c. The Surge S1 is an entry-level to mid-tier SoC designed to compete against the Qualcomm Snapdragon 625 and MediaTek Helio P20. In some areas it matches these two established companies' mid-range options, and in some areas it falls behind. On the CPU side we're looking at two four-core ARM Cortex-A53 modules in a big.LITTLE configuration. The big, or high performance quad-core is clocked at up to 2.2 GHz, while the LITTLE power efficient quad-core is clocked up to 1.4 GHz. This design isn't at all revolutionary; it's been used across mid-tier and entry-level SoCs for several years now. As for graphics, we're seeing a Mali-T860 MP4 at an unspecified clock speed. 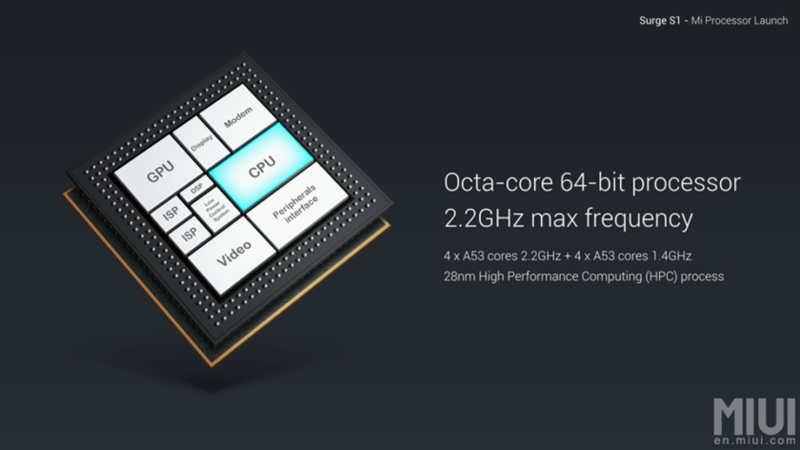 Xiaomi's benchmarks, which used the GFXBench Manhattan off-screen test, claim that this GPU is significantly more powerful than the Snapdragon 625's Adreno 506 and Helio P20's Mali-T880 MP2. Other features of the SoC include a 32-bit DSP with VoLTE support, a 14-bit dual-ISP with support for up to 36-megapixel cameras, integrated LTE Category 4, eMMC 5.0, and a dual-channel LPDDR3 933 MHz memory controller. The SoC supports 4K capture and playback at 30 frames per second, and even supports HEVC codecs. The most disappointing aspect of the Surge S1 is Xiaomi's choice of process technology. This SoC is built on a 28nm process, which is naturally less power efficient than the 14nm and 16nm process nodes used by Qualcomm and MediaTek respectively. Both competing companies also offer better connectivity baked into their SoCs. The first phone to use the Surge S1, the Xiaomi Mi 5c, will launch in China on March 3rd for ¥1,499 ($220).